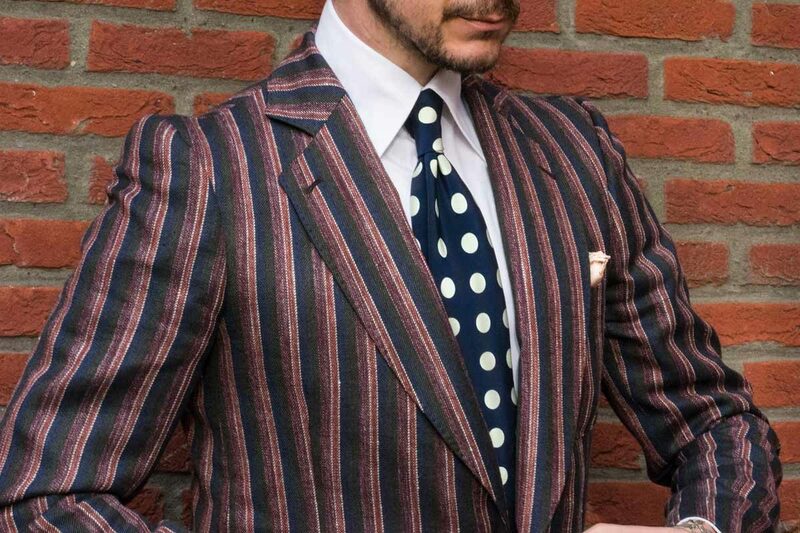 A Mess of Blues vintage silk tie featuring a white and navy polka dot print, worn with a white shirt and contrasting striped single-breasted blazer. A new men’s luxury accessories and grooming brand, Mess of Blues sets out to meld traditional Italian craftsmanship with forward-thinking, rock ’n’ roll-inflected attitude. The company’s goods are, says designer Stefano Zamuner, created with the modern man in mind, but still made by hand in the classic way. In conversation with The Rake, Zamuner explains the thinking behind the brand and its unique product mix — ties, silk pocket squares and bandanas, jewellery and high-quality hair-care. For those unfamiliar with the brand, what can you tell us about the genesis of Mess of Blues? The brand launched in February 2016 but its concept was in my mind since a few years back. Eighteen months before launch, I had been working behind scenes, shaping the product ideas, developing prototypes and taking the best Italian craftsmanship to propel the design identity I wanted to originate, an identity inspired by the nostalgia of the 50s and 60s gentlemen, presented impeccably in our current society. Why did you name the brand after an Elvis Presley song? I’ve always been a great Elvis admirer, but not in a fanatical and commercial way. I’ve just always thought he was and still is the coolest and most charismatic man who ever walked on this planet. I love his voice — so pure and filled with jazz and blues tones — and his bold sense of style, especially in the 1960s. The song A Mess of Blues refers to a mix of feelings and emotions in a love story, something we’ve all been through as men, but it also encourages us not to hide behind those emotions, to embrace them, stay focused and get all the positive energy together in order to overcome the moment and move on to the next chapter in our lives. I just loved these lines — “I gotta get myself together / Before I lose my mind / I’m gonna catch the next train goin’ / And leave my blues behind” — and I thought, ‘I can translate this into a beautiful gentlemen’s collection’. What are Mess of Blues’ key design inspirations and philosophies? Going back to the brand’s name, it’s all about that effortless style and confidence that the biggest names in rock, jazz and blues music — from Elvis to Sinatra, Miles Davis to Muddy Waters — expressed through their lives, on and off stage. They proudly wore fresh pressed suits, shirts and ties or other statement accessories both in casual or formal occasions. They simply cared to look sharp, without thinking about being ‘on trend’. I want to bring back this attitude of striving to be impeccable all the time, of wanting to show our best side and to dress appropriately for the occasion. All of this, with a fresh yet timeless mind. I’m Italian, from Venice, but I’ve been living in an international scene for a while, thanks to my profession as designer. I wanted to incorporate my heritage into my products in a subtle yet bold way, with their honest proportions, choosing the fabrics that express a link to my homeland, but still being international. How do you strive to make your products unique or personally tailored? What we do, we call “Creating bespoke tales with Italian Heart”. Tales that, in the future, will be shaping more and more into visual stories printed on silk, and suitable as foundation for different kinds of goods, from suits to ties to leather accessories. As my initial design background is in fashion illustration, I personally hand-draw all my ideas, I mix them with special vintage fabrics, used on ties for example, and almost at the same time I start designing the exterior lines of the products. In fact, a big part of the business is becoming designing suits for private clients; suits that we make unique by printing our seasonal artworks or by creating artworks ad-hoc to fulfil our client’s dreams. All silk linings and accessories are printed and hand-stitched in Como, the absolute best place to achieve that character and quality standard we are looking for. What sets Mess of Blues products apart from competitors’? Insofar as our ties, pocket squares and scarves go, I want them to be fresh and timeless, but still made by hand, in the classic old way, featuring three-, five- and seven-fold constructions, hand-rolled edges and uniquely shaped details in the case of garments. Jewellery is also an important part of the collection because they can lift up a look with their bold somehow rough, yet elegant appearance. They’re all vintage pieces handmade in Mexico out of silver and real turquoise stones. We also produce grooming products. Actually, our very first product was the Cream Pomade. Think about it, those big stars I mentioned before really cared a lot about their hair. That’s why I wanted to create one single hair product, the only one a man will need, that could give a sharp yet natural look, with medium hold and that keeps hair moisturised and soft. Perfect for a matte look if applied on dry hair, it gives a slight silky shine if applied on damp hair. An important factor was the scent, which mixes a light base of whiskey and green oak moss, some medium tones such as myrrh, while fresh citrusy and crispy berry tones help to keep it exciting and magnetic. We developed a small batch of the actual eau de toilette perfume. It sold out immediately, so it’s definitely in the plans to remake its return in a big way. Why did you choose to go into men’s grooming? In the last five years, the barbering and men’s hair cosmetic scene has grown immensely. Still, when I started, I believed there was space for a high-end grooming product which stands out both for healthy ingredients and for a masculine yet exclusive image without belonging to a big cosmetic house name. We took the women’s business as inspiration — it was clear, women perceive creams as higher-end products than gels or waxes. They also care about health and benefits to their body and insist that products are not tested on animals. Last but not least, the very top quality ladies’ cosmetics all have is beautiful packaging that reflects a sophisticated image. We went through a huge amount of research, trying samples and reading specs on labels. 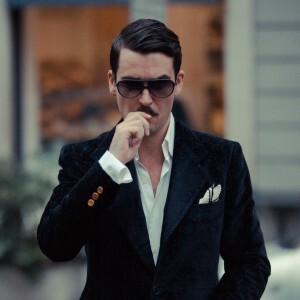 The majority of men’s products in general don’t have those characteristics all together in one single hair pomade. We combined all these aspects in a compact blue and gold jar. 100ml of healthy pleasure for your hair.